Union Budget 2015-16 was the first full-year Budget of the Narendra Modi government and, therefore, one of the most anticipated events for capital markets and investors. But did it live up to the hype and hope that stock analysts and investors had built in the run-up to the event that was expected to be a launch pad for big reforms? "The Budget provides tailwinds for growth, which will translate into demand recovery and, hence, earnings growth for companies," says Aashish Somaiyaa, CEO, Motilal Oswal AMC. The Budget had no big announcements, which explains the see-saw movement of stock markets on the day it was tabled in Parliament. Anand Rathi Financial Services Chairman Anand Rathi says the Budget did not aim for big changes but focused on easing conditions for businesses and recognised the need for big public spending to start the investment cycle. This is seconded by Anand Radhakrishnan, CIO, Franklin Equity. The Budget, he says, is the government's revenue and expenditure statement and gives policy direction to companies. "The government seems to be focusing on improving the country's infrastructure. It has taken many steps for that, including a big outlay for roads and railways." The increase in Plan spend by Rs 1.5 trillion (1.1% of GDP), after a weak 2014-15 when it was cut to meet fiscal deficit targets, is a positive. Dhananjay Sinha, head, Institutional Research, Emkay Global Financial Services, says the Budget has a lot for the infrastructure sector, especially roads and railways. It has also announced the setting up of a National Investment and Infrastructure Fund (NIIF) with annual contribution of Rs 20,000 crore. "These measures could have a ripple effect across allied sectors. Sectors leveraged to resurgence in domestic investment and capital expenditure will see some recovery in 2015-16," says Franklin's Radhakrishnan. "The biggest gainers will be construction, cement, steel and commercial vehicle companies," says Ravi Shenoy, AVP, Midcaps Research, Motilal Oswal Securities. "Announcement of five new ultra mega power projects, each 4,000 Mw, in the plug-and-play mode will create a lot of opportunities for generation equipment players as well," says Pankaj Pandey, head of research, ICICI Securities. Also, the move to reduce the corporate tax rate from 30% to 25%, though over the next four years, will improve corporate profitability. "The Budget also has proposals to convert gold into financial savings, simplify Real Estate Investment Trusts (REITs) and discourage cash transitions," says Pandey of ICICI Securities. "Other reforms include a bankruptcy law that will reduce non-performing assets (NPAs) of banks," he says. Further, distinction between different types of foreign investment, especially foreign portfolio and foreign direct, has been done away with. This will be positive for many companies wanting to attract money from foreign investors. All eyes are now on impact the Budget will have on corporate earnings and, hence, stock markets. Sinha of Emkay says the Budget has done little for corporate earnings in the immediate term. Hence, market valuations are looking high, he says. That's why stock markets have seen a mild pullback after the Budget. Sinha wants to focus on select themes, especially the road sector, and bigger players in the construction space. "In the banking sector, private sector banks will continue to be the winning theme. Government banks will lag due to modest recapitalisation support in the Budget," he says. Pandey of ICICI is bullish on sectors focused on the domestic market such as automobile, cement, capital goods and banking. He says defensive sectors like fast moving consumer goods, pharmaceutical and information technology could perform in line with broader markets. He maintains his December 2015 Sensex and Nifty targets of 32,500 and 9,750, respectively. Ridham Desai, MD and Head of Research, Morgan Stanley, estimates 24% a year growth in Sensex earnings in the coming two years. He is overweight on private sector bank, industrial, consumption and technology themes. An analysis by Kapil Bali, CEO,YES Invest, suggests the Nifty has given negative returns in six months after the Budget on just three out of past 12 occasions. "Given that this time returns will be driven by improvement in earnings, we can expect long-term returns to exceed the average by a wide margin," he says. The Budget's focus on roads, farm credit and savings are positive for the sector. Higher farm credit will improve rural incomes and, in turn, increase demand for tractors and two-wheelers. The new tax exemptions will increase savings and so demand for two-wheelers and cars. Reduction in the rate of corporate tax and rationalisation of tax exemptions will be good for companies that pay higher taxes. 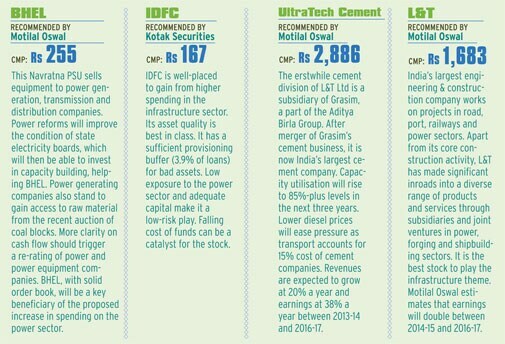 Higher spending on infrastructure will help cement companies. Around 60% cement demand is accounted for by housing, 20% by infrastructure and 20% by industrial activity. There are a few negatives for the sector too. For example, the clean energy cess will increase power & fuel costs. Increased tax savings and higher spending in rural areas will push up demand for consumer goods. Under the Housing for All by 2022 scheme, the country will have to build 20 million houses in urban areas and 40 million houses in rural areas. This will be good for paint companies. Reduction in the corporate tax rate and phasing out of exemptions are positive for FMCG companies, most of which pay tax at the maximum marginal rate of 30%. Efforts to increase rural wages, for instance through increase in allocation for the rural job scheme, is also positive for most FMCG companies which focus on rural markets. The sector is pinning hope on getting more orders as the government works out ways to get the infrastructure sector going. The increase in infrastructure spending by Rs 70,000 crore and Rs 25,000 allocation for the Rural Infrastructure Development Fund (RIDF) will expand the order book of construction and infrastructure companies. The increase in pace of award of road contracts will benefit engineering, production and construction players in the road sector. The sector will also benefit from reduction in the corporate tax rate. One negative is increase in the clean energy cess on coal. The decline in the corporate tax rate will benefit companies with higher effective tax rates. The tax rate on royalty earned on rendering technical services will now be 10% instead of 25%. Higher depreciation will be allowed for setting up manufacturing units in Andhra Pradesh and Telangana. IT companies could gain from the plans to build smart cities and digitise India. The Budget has eased rules regarding REITs. It seeks to rationalise the capital gains regime for sponsors exiting at the time of listing subject to payment of Securities Transaction Tax. Further, rental income from assets directly held by the REIT is proposed to be taxed in hands of unit holders.